A 5-minute walk from Baga Beach, this riverfront boutique resort features individually designed rooms with Greek-inspired décor and a balcony facing the pool. Boasting an outdoor swimming pool, restaurant and bar, it also offers exclusive yacht cruises. Air-conditioned rooms at Mykonos Blu feature custom furnishings and contemporary Greek column arcs, with hints of the colour blue. They have a flat-screen TV with cable channels and private bathroom with bathtub. A minibar and tea/coffee making facilities are included. Wi-Fi access is available at a fee. Mykonos is 11 km from Panaji, the capital of Goa. 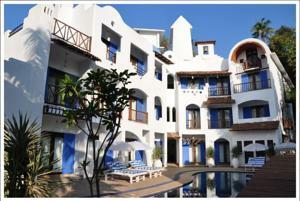 The resort is about 45 km from Goa's Dabolim Airport. Guests can book a fishing cruise or go on a dolphin watching trip. Water sport facilities are available for rent. M's Greek restaurant serves Indian delights and European favourites. The restaurant extends to a private bar. Free! Up to two children under 6 years stay free of charge when using existing beds. One child from 16 to 12 years is charged INR 880 per night and person in an extra bed. One older child or adult is charged INR 1760 per night and person in an extra bed. One child under 2 years is charged INR 750 per night and person in a baby beds. Maximum capacity of extra beds in a room is 1. Any type of extra bed or crib is upon request and needs to be confirmed by the hotel. Supplements will not be calculated automatically in the total costs and have to be paid separately in the hotel.